Knox Peden, Spinoza Contra Phenomenology. French Rationalism from Cavaillès to Deleuze. Cultural Memory in the Present (Stanford, CA: Stanford University Press, 2014, in press). 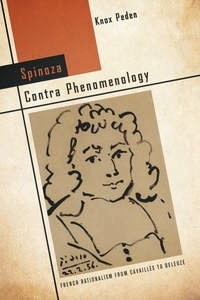 Spinoza Contra Phenomenology fundamentally recasts the history of postwar French thought, which is typically presumed by detractors and celebrants alike to have been driven by a critique of reason indebted above all to Nietzsche and Heidegger. Although the reception of German phenomenology gave rise to many of the most innovative developments in French philosophy, from existentialism to deconstruction, not everyone in France was pleased with this German import. The book recounts how a series of French philosophers used Spinoza's rationalism to erect a bulwark against the nominally irrationalist tendencies of Husserl's and Heidegger's thought in France. From its beginnings in the interwar years in philosophy of science and the history of philosophy, this Spinozist rationalism would prove foundational for Louis Althusser's rethinking of Marxism and Gilles Deleuze's ambitious metaphysics. There has been a renewed enthusiasm for Spinozism in various quarters of late by those who would see his work as a kind of neo-vitalism or philosophy of life and affect. Peden bucks the trend by tracking a decisive and neglected aspect of Spinoza's philosophy—his rationalism—in a body of thought too often presumed to have rejected reason. In the process, he demonstrates that the critical resources of Spinoza's rationalism have yet to be exhausted today.